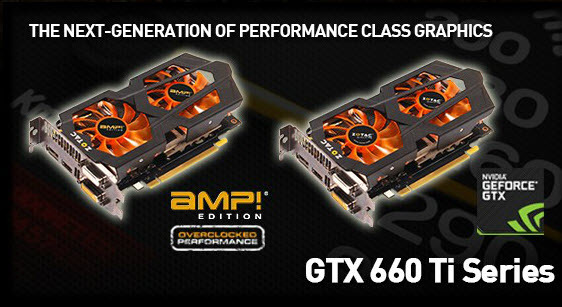 ZOTAC has just announced the availability of the GeForce GTX 660 Ti AMP edition featuring 2 GB of GDDR5 memory with reference settings and features ZOTAC’s custom AMP GPU cooler for maxim heat dispersion. ZOTAC International, a global innovator and channel manufacturer of graphics cards, mainboards and mini-PCs, today unleashes a new generation of performance class graphics with the ZOTAC GeForce GTX 660 Ti and GeForce GTX 660 Ti AMP! Edition graphics cards. The new ZOTAC GeForce GTX 660 Ti duo introduces NVIDIA’s latest architecture to value-conscious gamers seeking the best performance and features. 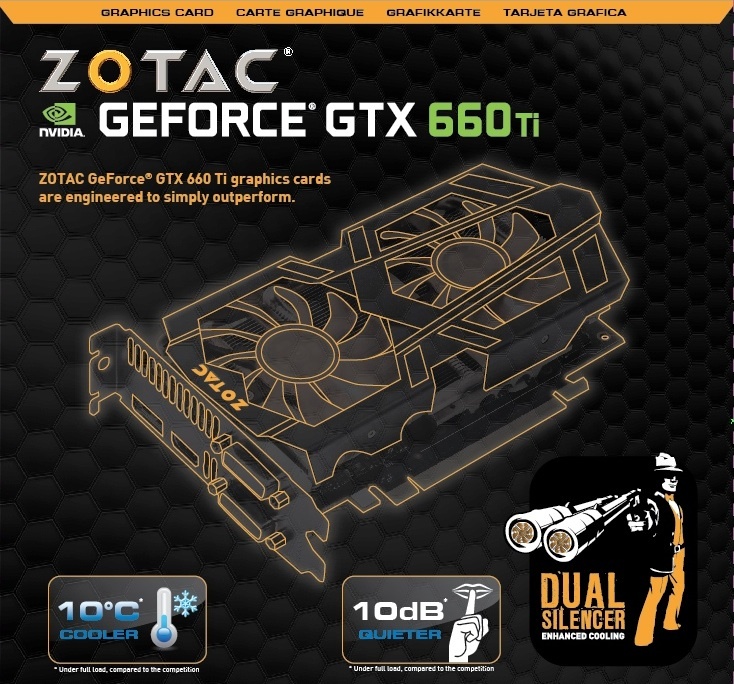 New to the ZOTAC GeForce GTX 660 Ti series is the exclusive Dual Silencer cooling solution that delivers temperatures 10-degree (Celsius) cooler and a 10dB noise reduction under full load for a superior gaming experience compared to competitors. The ZOTAC Dual Silencer provides the ZOTAC GeForce GTX 660 Ti AMP! Edition with the thermal headroom necessary to push the limits and extract an extra 10-percent performance boost for higher frame rates and smoother game play. “Gamers and enthusiasts demanded we introduce a graphics card with a custom cooler that brought the latest features such as NVIDIA Surround and NVIDIA GPU Boost to the performance-class price point. We listened and spent the last couple of months coming up with the ZOTAC GeForce GTX 660 Ti series with our exclusive Dual Silencer enhanced cooling solution,” said Carsten Berger, marketing director, ZOTAC International. Sporting the latest NVIDIA SMX architecture the ZOTAC GeForce GTX 660 Ti delivers superior gaming performance and improves energy-efficiency by 11-percent from previous generations while the ZOTAC GeForce GTX 660 Ti cranks up the clock speeds to uncharted levels. The result is an unchained gaming experience that lets gamers turn up the visual details without sacrificing smoothness or playability with the ZOTAC GeForce GTX 660 Ti series. NVIDIA Surround technology enables the ZOTAC GeForce GTX 660 Ti series to drive three simultaneous displays for immersive gaming while support for a fourth monitor in desktop mode enables superior productivity for the perfect combination of work and play from a single graphics card. DirectX 11.1 technology & Shader Model 5. 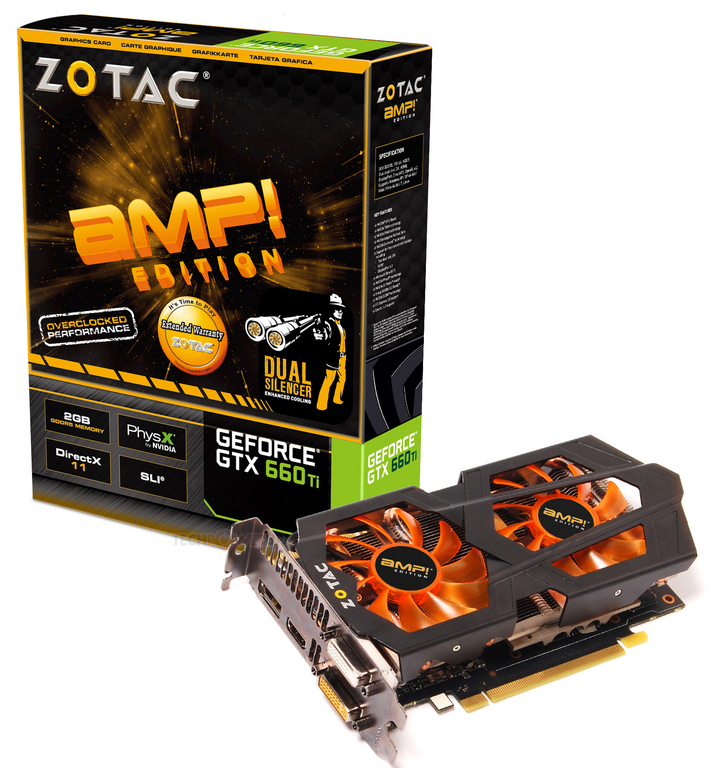 Product Link – Zotac GTX 660 Ti AMP!